Great for running the RV while out on the road, or for keeping essential appliances going during a power outage, the Sportsman Series Tri Fuel Generator has the power and flexibility to handle the task. 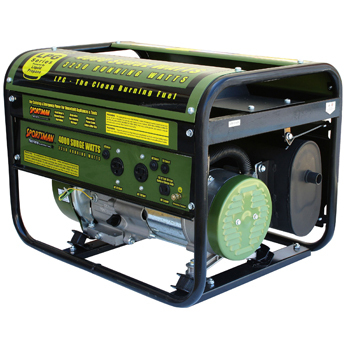 This generator runs on either unleaded gasoline, natural gas, or propane gas, so you can use whichever fuel is more easily available or affordable at the moment. With the Sportsman Series 9,000 Watt Tri Fuel Generator, you get the long lasting, clean burning advantage of propane and natural gas, plus the familiar and easy to find benefits of unleaded gasoline. With 9,000 peak surge watts and 7,200 rated continuous watts the Sportsman Series Tri Fuel Generator is a powerful generator than can handle the needs of most contractors, homeowners and recreational activities. 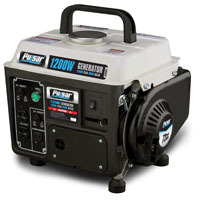 Equipped with four 120 volt outlets, a single 120V RV outlet, a 12 volt DC outlet for battery charging, and a 120/240 volt twist lock outlet, this generator can run just about anything. Use the generator right out of the box with the recoil start or install a motorcycle battery (not included) to activate the electric start feature. The Sportsman Series 9,000 Watt Tri Fuel Generator boasts an engine run time of 10 hours at 50% load. A 5 foot propane fuel hose with a regulator is included for your added convenience. The 15 HP engine is surprisingly quiet; it runs at less than 80 Db. The Sportsman Series 9,000 Watt Tri Fuel Generator is ideal for anyone who needs affordable, flexible, and portable power. The Sportsman Propane 2000 Watt Portable Generator can power common household appliances and power tools. It is equipped with a single 120 volt outlet and a 12 volt DC outlet for battery charging. A generator of this size is ideal for small camping or tailgating parties or to have on hand in case you need some temporary power in an emergency situation. It has a 2.4 HP 4-Stroke OHV Recoil Start engine. It boasts an Engine Run Time of 12 Hours at 50% on a common 20Lb (gas grill type) cylinder (LPG cylinder not included). A 5 foot propane fuel hose with a regulator is included for your added convenience. The engine is surprisingly quiet; it runs at less than 65 Db. This is a great generator for anyone who needs affordable power. Propane has several distinct advantages over gasoline generators. Propane burns cleaner than gas engines. Carbon monoxide emissions run up to 40% lower. Propane will not degrade, so you can keep several propane tanks on hand for emergencies and store them for an unlimited amount of time. 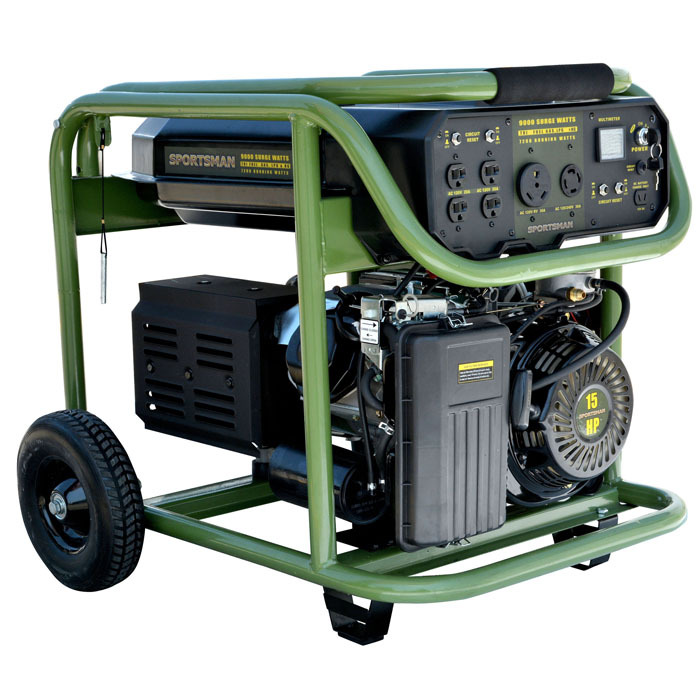 Since this generator runs on propane you never have to worry about the fuel going bad or having the carburetor getting fouled due to degenerated gasoline - a common problem with gasoline powered small engines. Unfortunately, this model cannot be converted to operate with natural gas. The Sportsman Propane 4000 Watt Portable Generator can power common household appliances and power tools. It is equipped with two -120 volt outlets and a 12 volt DC outlet for battery charging. A generator of this size is ideal for small camping or tailgating parties or to have on hand in case you need some temporary power in an emergency situation. It has a 7HP 4-Stroke OHV Recoil Start engine. Its affordable but well thought out with full featured options such as Automatic Low Oil Shutdown and Automatic Voltage Regulator. It boasts an engine run time of 10 hours at 50% on a common 20Lb (gas grill type) cylinder (LPG cylinder not included). A 5 foot propane fuel hose with a regulator is included for your added convenience. The engine is surprisingly quiet; it runs at less than 68 Db. This is a great generator for anyone who needs affordable power. 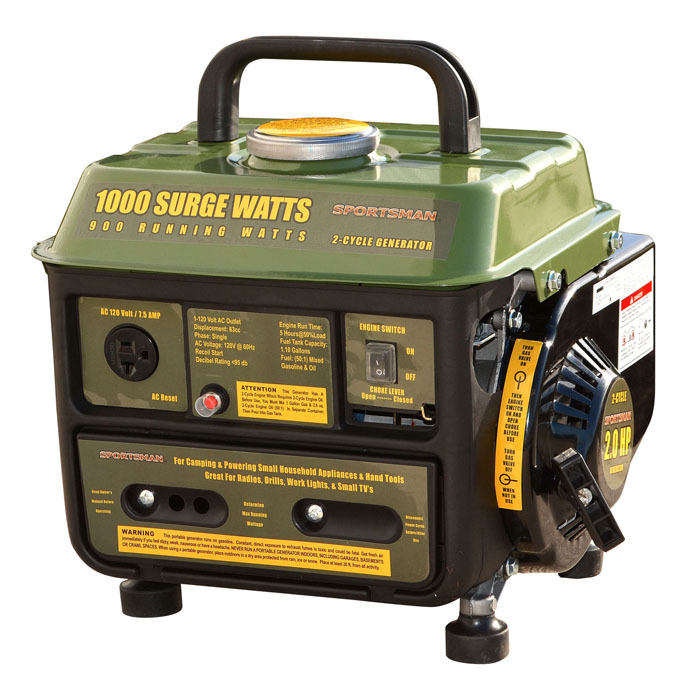 The Sportsman Series Gasoline 4000 Surge Watt Portable Generator is ideal for powering the RV at the campsite, and a great solution for recreational activities as well as for temporary power supply in case of power outages. This 4000 watt unit is the perfect size to take for that weekend getaway, to tailgate the game at the stadium, or in case you need some temporary power in an emergency situation. It is ideal for hunters and campers running portable TVs, radio, small stoves, grills, and other small appliances. This recoil start generator can run for 10 hours with a 50% load on 3.6 gallons of gas. It is equipped with four 120 volt outlets, one 120V RV outlet and a 12 volt DC outlet for battery charging. 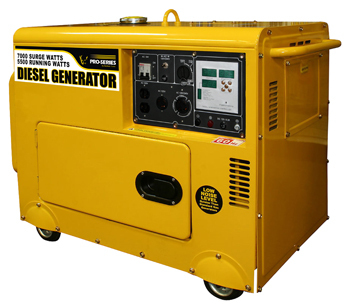 This generator is powered by unleaded gasoline which is a convenient and easy to find fuel source. Choosing a gasoline generator like the Sportsman Series 4000 Watt Portable Gasoline Generator can ease your worry when catastrophe strikes, and make your leisure activities even more fun. 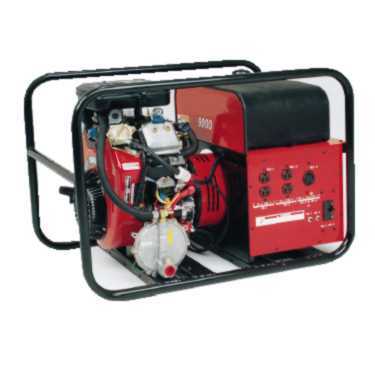 The HPS9000E also operates on gasoline, L.P. gas, or natural gas. With inherent voltage regulation, 9000 watts of surge energy, and 8000 watts continuous power, this generator is dependable and has an efficient design. You will never be left in the dark with this generator. It has a 120/240v AC Output voltage, continuous current rating of 66.7/33.3 amps with a 480cc/OHV displacement/type, 77.25 dBA DB Rating @ 7 meters (23 ft.), 1.0 pf Power Factor (pf), "Phase, Frequency" is 1-phase, 60 hz, Motor Starting Ability (hp) is 4 hp, R.F.L. Generator Type . It has a Rated Power (3600 RPM) of 16 h.p, an electric/recoil starting system (Electric start models include battery rack and cables. Battery not included), Air Cooling System, Standard Main Breaker,U1 - 235 cca Recommended Battery Size (Group/CCA), 3600 rpm Engine Speed. It has a 4.5 gallon fuel tank capacity, 3.4 hours Running Time (Full Load), 5.6 hours Running Time (Half Load), standard low oil protection. Full load consumption: Gasoline 1.3gal/hr, L.P. 2.7 gal/hr, 30 amps, 7200 watts. Natural Gas 200 cu ft/hr, 26.7 amps, 6400 watts. With 2 Wheel Dolly Kit is 16204-000, 4 Wheel Dolly Kit is 16199-001 and Cover is 64444-012. 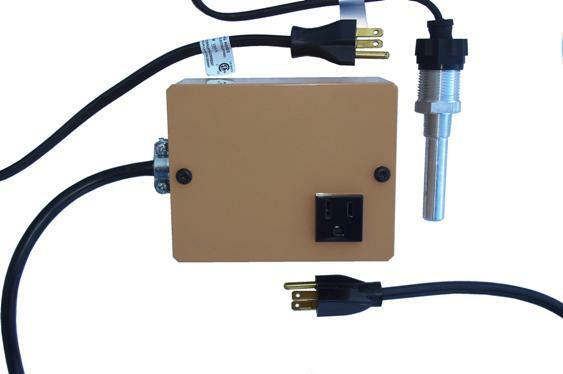 The Transfer Switches with EMER-TRANS SYS/SW60/30 is Suggested.They also have a 4-20 amp straight blade (120v receptacles) and a 1-30amp twist-lock (120/240v receptacles) Dimension: 32 x 22 x 22 in. The generator and engine both have a 2-year warranty. The shipping time for this item is up to one week. 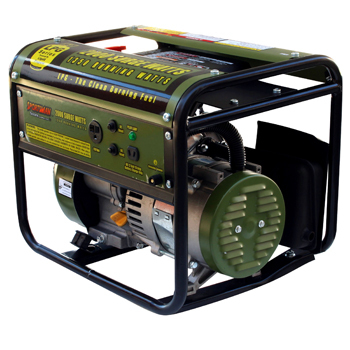 This generator operates on gasoline or natural gas and converting from one fuel source to another is quick and easy. The HPS6000HE features inherent voltage regulation. With 6000 watts of surge energy and 5500 watts continuous power, this generator is capable of starting a 2hp motor. start models include battery rack and cables. Battery not included). It has a 4.5 gallon fuel tank capacity, Running Time (Full Load) is 4.5 hours, Running Time (Half Load) is 6.4 hours. L.P. Information: 1.1 gal/hr Rate Of Consumption (Full Load), 4900 watts, 20.6 amps. Natural Gas: 77 cu ft/hr Rate Of Consumption (Full Load) , 18.3 amps, 4400 watts. Dimension: 30 x 22 x 22 in. The generator and engine both have a 2 year warranty. The shipping time for this item is up to one week.. UL Listed.. 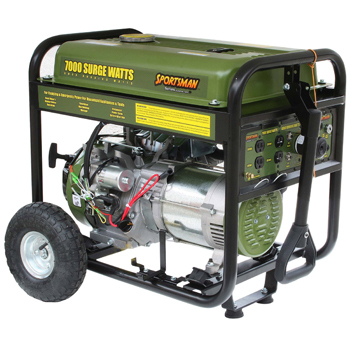 The Sportsman Propane 7000 Watt Portable Generator can power common household appliances and power tools. It is equipped with four 120 volt outlets, a 12 volt DC outlet for battery charging, and a 120/240 volt outlet. Use this generator immediately with the recoil start or install a motorcycle battery (not included) to activate the electric start feature. A generator of this size is ideal for camping and running essential household appliances during power outages. 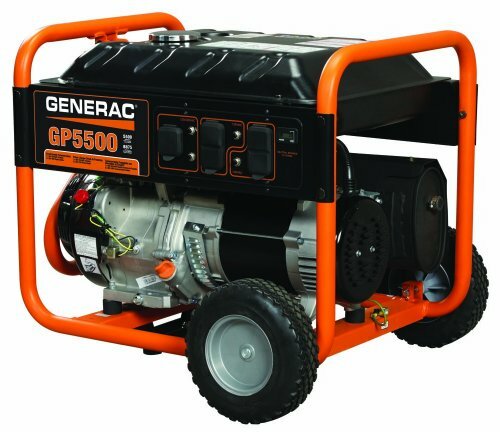 This generator is a real workhorse with great features like a 13HP 4-Stroke OHV engine, Automatic Low Oil Shutdown and an Automatic Voltage Regulator for an affordable price. It boasts an engine run time of 8 hours at 50% on a common 20Lb (gas grill type) cylinder (LPG cylinder not included). A 5 foot propane fuel hose with a regulator is included for your added convenience. The engine is surprisingly quiet; it runs at less than 80 Db. 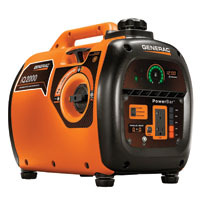 This is a great generator for anyone who needs affordable power. 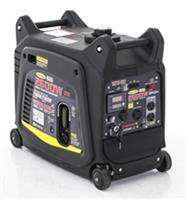 The Sportsman Series Gasoline 2000 Surge Watt Portable Generator can power common household appliances and power tools. It is equipped with a two 120 volt outlet and a 12 volt DC outlet for battery charging. This recoil start generator can run for 9 hours with a 50% load on 1.2 gallons of gasoline. 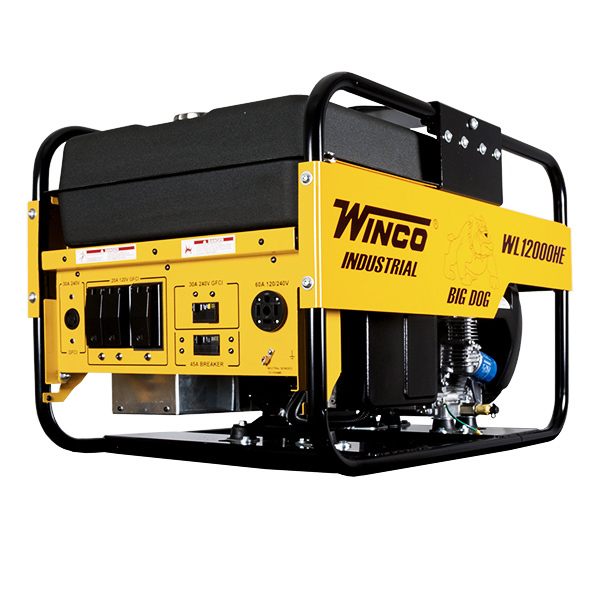 A generator of this size is ideal for small camping, tailgating parties, or powering tools in the work shed, and could save the day in case of a power outage. 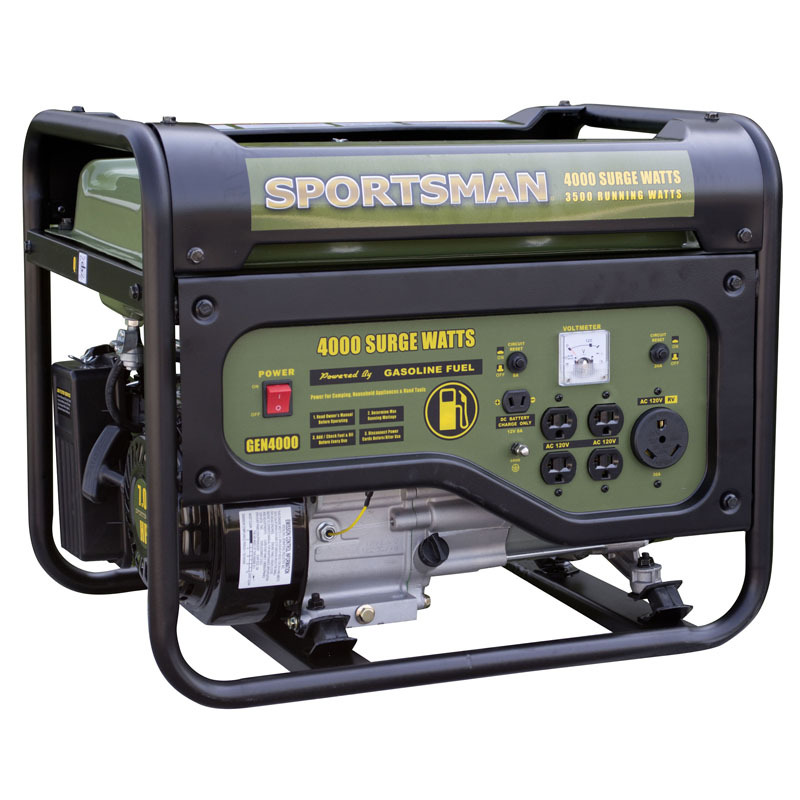 The Sportsman Series Gasoline 2000 Watt Portable Generator is powered by unleaded gasoline which is a convenient and easy to find fuel source. 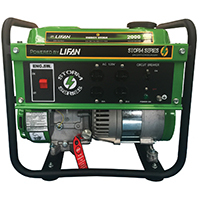 Choosing a gasoline generator like the Sportsman Series 2000 Watt Portable Gasoline Generator can ease your worry when catastrophe strikes, and make your leisure activities even more fun. The Sportsman 1000 Watt Portable Generator is the ideal size for hunters and campers who wish to run portable TV's, radios, small stoves, grills, and other small appliances. Light weight and portable, this Generator can easily be transported in the truck of a car for use at tailgating parties or campsites. 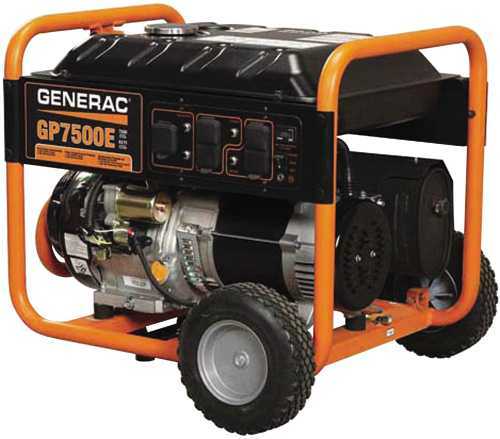 The generator is equipped with a single 120 volt outlet.This recoil start generator can run for 5 hours with a 50% load on 1.1 gallon of fuel. CARB approved for sale in California. This is a great choice for the small contractor who requires power for table saws, small air compressors, saws and drills. The Honda GX270 engine will start up to a 1.5hp motor and put out a continuous 4500 watts of power with surge capacity to 5000 watts! Standard automatic idle control and hour meter. Features include; powder paint finish on rugged wrap-around welded tubular cradles, CARB/EPA approveds. 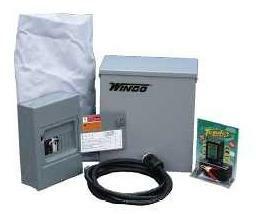 WINCOs switchless Full Power feature allows the full rated output from a single 120 volt or 240 volt outlet, or ombination of both. 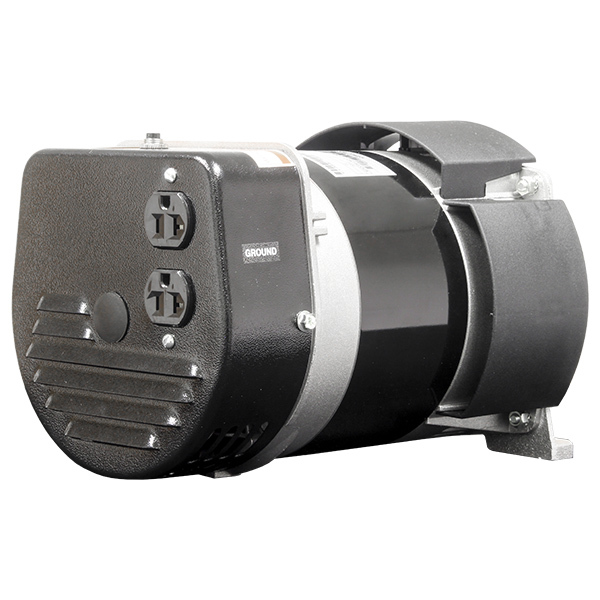 It has a maximum power rating of 5000w, continuous power rating of 4500w, an AC output of 120/240v, continuous current rating of 37.5/18.8amps, 1.5hp motor starting ability, is a R.F.L. generator, has a displacement/type of 270cc/OHV, 3600rpm, standard low oil protection, recoil starting system,7 gallon fuel tank capacity, 10.2 hour run. DB Rating @ 7 meters (23 ft.) is 79.00 dBA , with 120 Volt Receptacles is 4 - 20 amp GFCI Straight Blade (NEMA 5-20R) , 1 - 50 amp Straight Blade (NEMA 5-50R) and 2 - 20 amp / GFCI Protected Twist Lock (NEMA L5-20R). Dimension: 32 x 22 x 22 in. 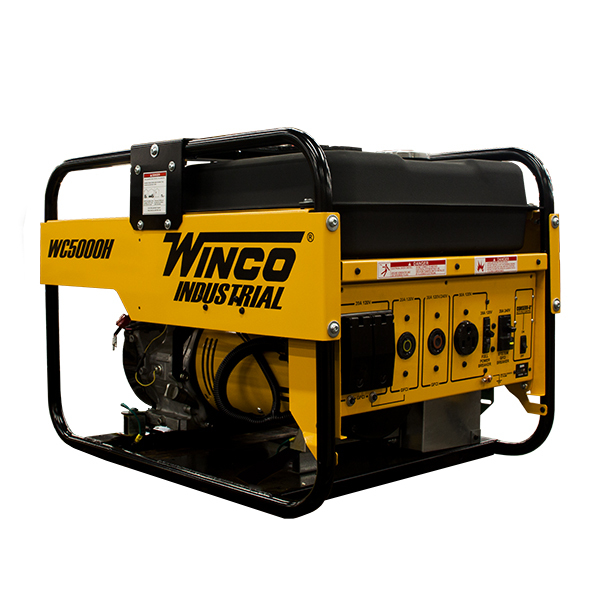 All industrial portable models carry a two-year generator warranty. The Pro Series Diesel 7000 Watt Generator can power common major household appliances and power tools. It is equipped with two 120 volt outlets, a 120 volt twist lock outlet, a 120/240 volt outlet and a 12 volt DC terminal for battery charging. With a full load of 6300 watts this generator can run for up to 7 hours. The Automatic Voltage Regulator controls the power output so the devices plugged into the generator won't get hit with an energy spike. This unit is designed for use at job and construction sites, with features like an eye hook to hang from cranes and scaffolding, and is engineered to run for long periods without too much noise or overheating. The engine noise level is less than 70 db, quite enough to work around all day long. A multi-function digital display panel shows the status of voltage, hertz, kilowatts, current, battery voltage, run time, engine temperature, and generator temperature, as well as an auto protection, diesel valve and starter indicator, and engine oil warning light. With so much information at your fingertips know exactly how much power you have left, so you can better control the draw and function of the unit. Two wireless keychain remote fobs let you start and stop the generator without walking across the job site. Use Pro-Series Diesel 7000 Watt Generator when you need safety, stability and dependability on your jobs and projects. It's easy to maneuver with the four installed wheels. This generator runs on diesel fuel, which is a stable and easily available fuel source, which burns more efficiently and requires less maintance than gasoline motors. Choosing a backup generator like the Pro Series Diesel 5500 Watt Generator can ease your worry when catastrophe strikes. A motorcycle battery (not included) must be installed to activate the electric start feature. 12 circut, 60 amp UL approved manaual transfer switches allow generator connection to electrical service for emergency power backup. Item is flush mount. UL Listed. 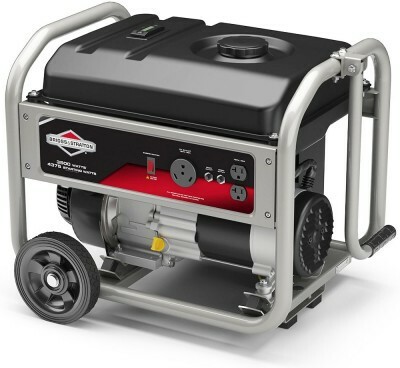 Great for running the RV while out on the road, or for keeping essential appliances going during a power outage, the Sportsman Series Dual Fuel Generator has the power and flexibility to handle the task. 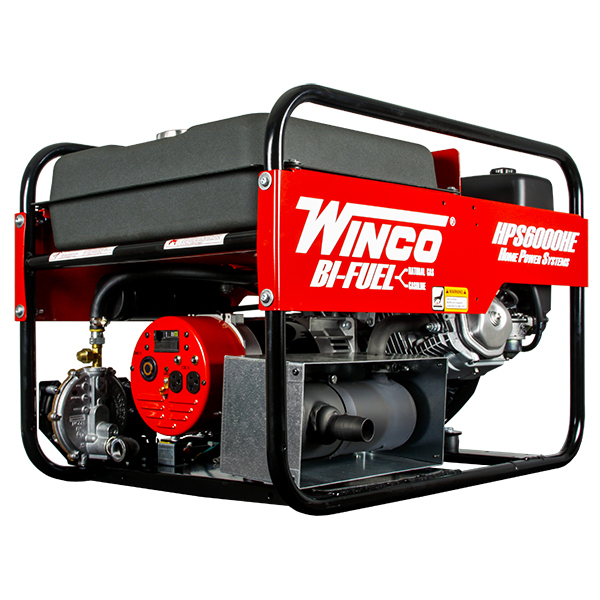 This generator runs on either unleaded gasoline or propane gas, so you can use whichever fuel is more easily available or affordable at the moment. With the Sportsman Series 9000 Watt Dual Fuel Generator, you get the long lasting, clean burning advantage of propane gas, plus the familiar and easy to find benefits of unleaded gasoline. With 9000 peak watts and 7500 rated watts the Sportsman Series Dual Fuel Generator is a powerful generator than can handle the needs of most contractors, homeowners and recreational activities. Equipped with four 120 volt outlets, one 120/240V twist lock outlet, and a single 120V RV outlet, this generator can run just about anything. Use the generator right out of the box with the recoil start or install a motorcycle battery (not included) to activate the electric start feature. 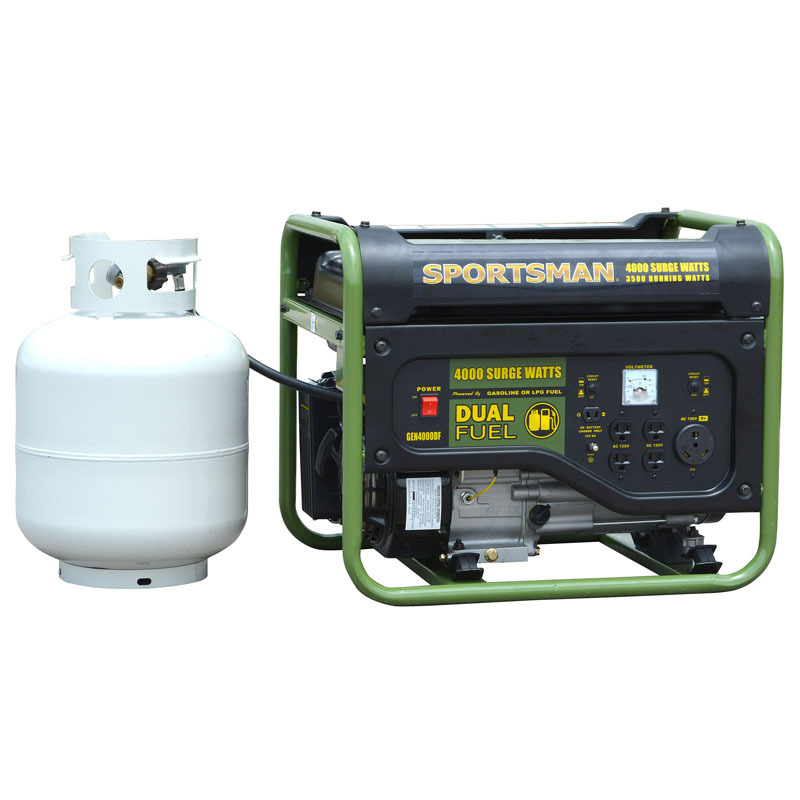 The Sportsman Series 9000 Watt Dual Fuel Generator boasts an engine run time of 10 hours at 50% on 8 gallons of unleaded gas or 5 hours at 50%on a common 20Lb (gas grill type) cylinder (LPG cylinder not included). The 15 HP engine is surprisingly quiet; it runs at less than 80 Db with no load. The Sportsman Series 9000 Watt Dual Fuel Generator is ideal for anyone who needs affordable, flexible, and portable power. Unfortunately, this model cannot be converted to operate with natural gas. 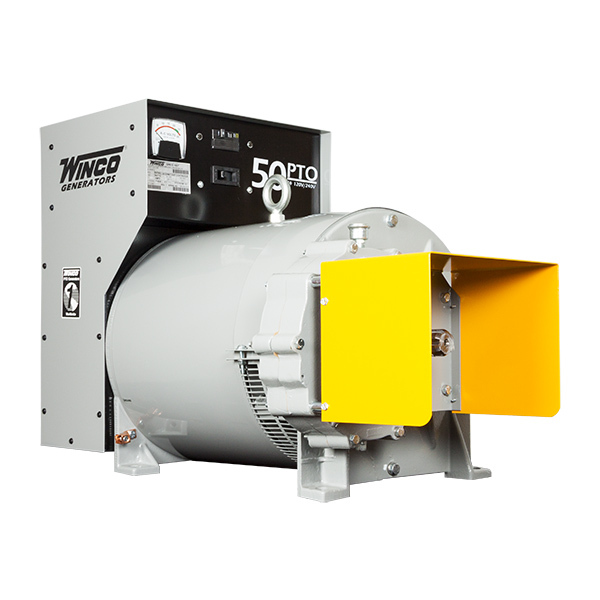 The 50PTOC-3 generator provides 50kW of continuous power and operates at 1800 RPM. The single-phase 120/240V unit has 1-20 amp NEMA 5-20R 120V duplex and 1-50 amp NEMA 6-50R 240V receptacle. This generator requires a 100hp tractor to run and operates at a PTO input speed of 540 RPM with 1000-RPM gear case optional. This generator has a maximum power rating of 50kw, 120/240v AC output, 208 continuous amps, generator speed of 1800rpms, receptacles, PTO input speed (rpm) of 540/1000 OPT, 25 hp Motor Starting Ability, R.F.B.Generator Type, Standard A.C. Volt Meter, 1-3/8 in.- 6 spline Shaft Diameter,100 hp Min Drive Hp Required, PTO/PTO Type/Drive Rotation Direction, Standard Single Point Lifting Eye. 1 - 20 amp Straight Blade (NEMA 5-20R) (120 Volt Receptacles), 1 - 50 amp Straight Blade (NEMA 6-50R) ( 240 Volt Receptacles), Standard Full Power Receptacle ( 120 / 240 Volt Receptacles), Main Breake. Accessories: Trailer is 64659-000, T-Bar is 54326-001. Dimension: 39 x 20 x 21 in. and a 3 year warranty. The shipping time for this item is up to one week. UL Listed..
Great for running the RV while out on the road, or for keeping essential appliances going during a power outage, the Sportsman Series 4000 Watt Dual Fuel Generator has the power and flexibility to handle the task. 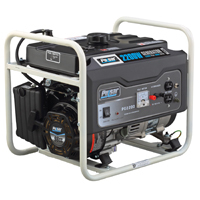 This generator runs on either unleaded gasoline or propane gas, so you can use whichever fuel is more easily available or affordable at the moment. 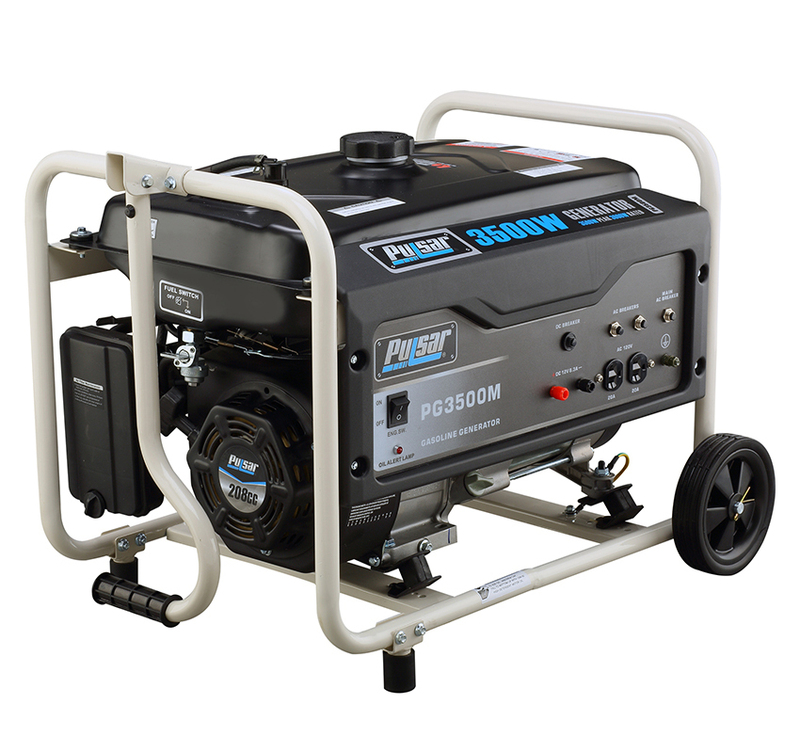 With the Sportsman Series Dual Fuel Generator, you get the long lasting, clean burning advantage of propane gas, plus the familiar and easy to find benefits of unleaded gasoline. 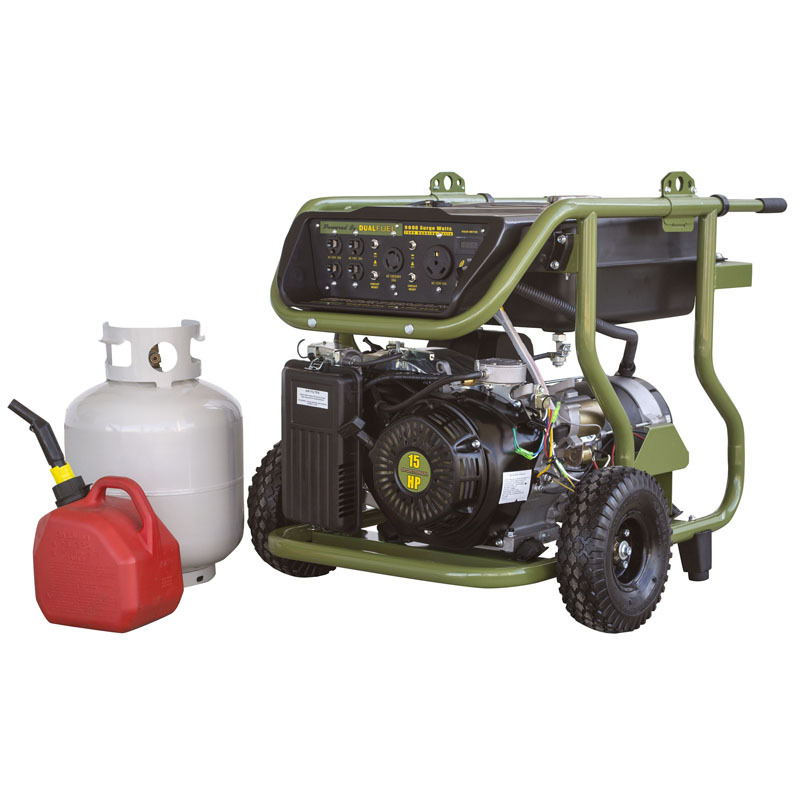 With 4000 peak watts and 3500 rated watts the Sportsman Series Dual Fuel Generator is a powerful generator than can handle the needs of most contractors, homeowners and recreational activities. Equipped with four 120-volt outlets, a single 120V RV outlet, and a 12 volt DC outlet for battery charging, this generator can handle almost everything you need for camping or tailgating. 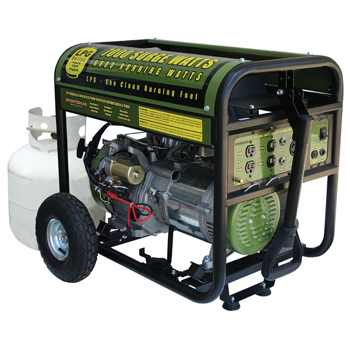 Dual Fuel Generator is ideal for anyone who needs affordable, flexible, and portable power. Unfortunately, this model cannot be converted to operate with natural gas. 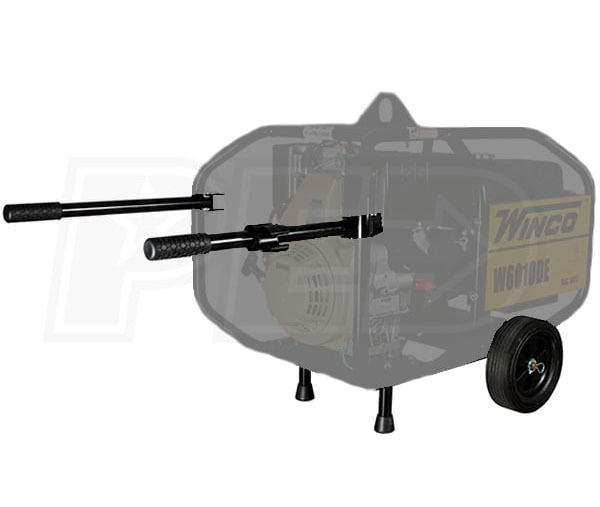 The WINCO 2-wheel dolly kit gives your generator excellent mobility on the ground. The 10" flat free tires get you through mud, snow, sand and soggy lawns. The solid steel axle runs the entire width of the generator providing superior strength. All components are protected from corrosion with our durable baked on powder coat paint system. Compatible with the WC6000HE, W6010DE & W10000VE. 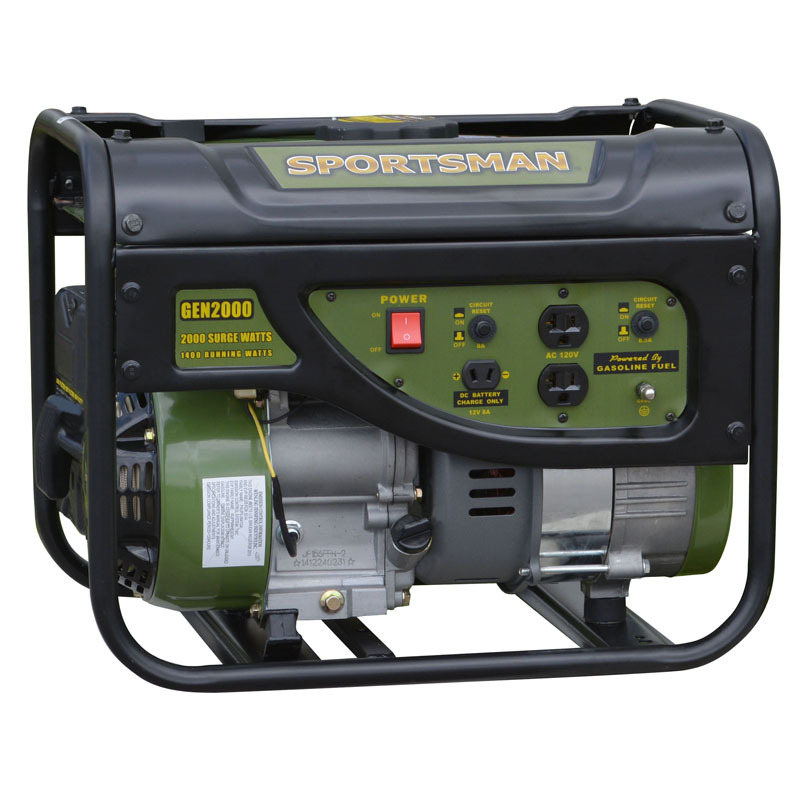 The Sportsman Series Gasoline 7000 Watt Portable Generator can power common major household appliances and power tools, and provide emergency power during blackouts. Equipped with four 120 volt outlets, a 12 volt DC outlet for battery charging, and a 120/240 volt outlet. Use this generator immediately with the recoil start or install a motorcycle battery (not included) to activate the electric start feature. With a 50% load this generator can run for 12 hours. A generator of this size is ideal for camping and running essential household appliances during power outages. It's easy to transport and maneuver when the included wheel kit is installed. Powered by unleaded gasoline which is a convenient and easy to find fuel source. Choosing a gasoline generator like the Sportsman Series 7000 Watt Portable Gasoline Generator can ease your worry when catastrophe strikes, and make your leisure activities even more fun. OIL HEATER KIT FOR PSS8. UL Listed. Features; Dependable HONDA overhead valve engine with electric start, Low oil protection automatically stops engine if crankcase oil is low, Generator has clean wave form, Total Harmonic Distortion <5%, Large 15-gallon fuel tank with gauge. Lifting eye standard. Durable powder paint finish on rugged wrap-around frame. Hour meter for keeping rental and service records. We have redesigned the Two-Bearing line. The TB2400 features water resistance and insulation protection.